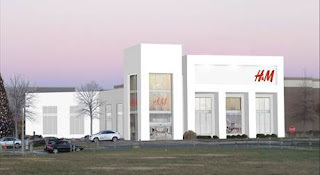 Metro Fitness plans to open its third Charlotte location next year, this one on Carmel Road in south Charlotte, in a location currently occupied by Two Pros Fitness. The 6,000-square-foot gym has a targeted opening date sometime in January. The facility, called Metro 51, will offer CrossFit, kickboxing, mixed martial arts, self-defense, conditioning and youth classes. Personal training services will also be available. "Metro 51 will offer the same high quality fitness experience that we are known for at our first two locations,” said Metro Fitness owner Denise Abood, in a statement. “From superior coaching to progressive training equipment to clean and upscale facilities, this location will look and feel Metro." The gym is partnering with E.Z. Smith IV to open the new Metro location. Smith IV currently owns Two Pros, which is being upgraded to transition to Metro. Smith IV will oversee the gym's day-to-day operations. There are currently Metro gym locations in Elizabeth and Myers Park. The first two Charlotte-area H&M stores are set to open in November and December, with Northlake Mall's store opening first, followed by the Carolina Place location. Northlake's grand opening is scheduled for noon on Thursday, Nov. 14. The event will feature giveaways and music, Northlake said. The Carolina Place store will open in early December, though an exact date hasn't been set, a mall representative said. In terms of size, the Northlake store will be larger than the Carolina Place store, clocking in at 25,600 square feet. It's located in the former Borders bookstore at Northlake. The Carolina Place store will be 17,000 square feet. Building permits show H&M is spending a substantial amount to upgrade and renovate both stores. At Northlake, permits show H&M is spending about $2 million on the new store. And at Carolina Place, the fast-fashion retailer is investing about $2.5 million. There's a new option for upscale lingerie at the Village at SouthPark, with a 1,262-square-foot I.C. London store that opened earlier this month. "As the lingerie and fine sleepwear boutique I.C. London celebrates 20 years in Charlotte, owner Shelly Domenech, 43, remembers when she almost handed over the keys. It was 1996. The boutique – a play on the “I see London, I see France” rhyme – was 7 and Domenech was 30. It was the only job she’d ever had. Her parents had bought the store in 1989, when it was named “Illusions” and located in their hometown of Hendersonville, about 100 miles west of Charlotte. 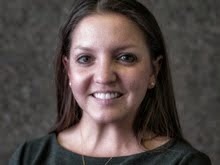 Domenech, a recent college graduate and an MBA student at UNC Charlotte became the sole owner at 23, moving the store to its current location off East Boulevard in Dilworth. She dropped out of the master’s program and signed the lease. Ten days later, her 52-year-old father died. “I said, ‘This is one of the last things my dad did on this earth. I’m going to make it work,’ ” Domenech recalls." In another round of the disappearing restaurants at Kenilworth Drive and East Blvd. saga, Longboards Tap and Taco is no more. I learned of the closure Friday night, when I had arranged to meet some friends there after work. When we showed up - whoops, no Longboards. Even most of the furniture in the darkened building had been removed. No one answered the restaurant's phone on Monday. "What went wrong? I don’t think you can open a restaurant in Charlotte without one parking space? Maybe you don’t need parking in New York City to run a successful restaurant but here you are dooming yourself to failure. Throw in Longboards mediocre food and you have a recipe for disaster. I drove by Longboards on Saturday and it looked like buzzards had picked the place clean, even the booths are gone. We give credit to groups that take it upon themselves to try to open restaurants and feel bad when they don’t make it. Longboards tried and failed." While I agree with Charlotte Restaurant Traffic that the food was "meh," I'll miss Longboards' good, fairly-priced local beer selection. The atmosphere, while at times a bit loud and confusing, was also a step up over Longboards' predecessors. So long, Longboards. We hardly knew ye. What do you think could make it in that spot? Anything? Bonus question: Do you think the huge mural on the side of the Longboards building should stay or go? Nana's Soul Food Kitchen, which has won praise for its down-home buffet meals featuring favorites such as collard greens and mac and cheese, is opening a second location next month in Indian Trail. Jody Yetti, director of operations for the restaurant, said the 3,500-square-foot location will be in the Carolina Courts basketball facility on Chestnut Parkway in Indian Trail. Shawn and Kiana Morrison started the original Nana's near Yorkmont and West Tyvola roads after moving to Charlotte from New York five years ago. "Mr. Morrison would always say, 'You can't get good soul food here," said Yetti. "He would say, 'My wife can cook better.'" Expansion had always been the plan, Yetti said. The grand opening for the Indian Trail location is set for Nov. 15 (updated from Nov. 8). This is Nana's second attempt to branch out. Nana's did try to open a fine-dining uptown restaurant last year, but it closed after eight months. Yetti said there wasn't enough parking to make the location in Gateway Village on Trade Street work. At the Indian Trail location, Yetti said they will try to continue many of the things that made the original Nana's a hit, such as its family feel. "We have a big church following on Sundays," said Yetti. "That's probably our biggest day." One thing they'll definitely have plenty of is the soul food. Yetti has trouble picking her favorite dish. "I love chef's bread pudding," she said. "I would say that, and the mac and cheese." Then she paused. "I take that back. The yams are my favorite. The yams are so good." American Girl fans, get excited: The company said Tuesday it plans to open a 12,000-square-foot store in SouthPark mall next year that will include a small restaurant and a doll hair salon. The store will be the doll company's only North Carolina retail outlet. The American Girl store will open in fall 2014, in the Macy's wing of SouthPark. "As a leader in experiential retail, American Girl has found a great partner in SouthPark Mall, a well-established premium retailer with an upscale mix of stores and restaurants," said said Wade Opland, American Girl’s vice president of retail, in a statement. "It's an ideal location to introduce American Girl to the area and we look forward to opening our doors next fall." "American Girl fans will be able to enjoy a meal and a delicious dessert or celebrate a birthday in the store’s fun and casual 25-seat Bistro, treat their dolls to a new hairdo in the Doll Hair Salon, or design a cute doll-sized T-shirt in the “Creativi-Tees” boutique." There are currently 16 American Girl retail stores, with its first and flagship retail store opened in Chicago in 1998. The closest to Charlotte are in Atlanta and Washington, D.C. American Girl is a division of toy maker Mattel, Inc.
Simon Property Group owns SouthPark mall, the region's largest shopping center at 1.6 million square feet. The mall is more than 94 percent occupied, according to Simon's most recent annual report. at SouthPark, in a statement. "We strive to continuously evolve as a shopping destination and American Girl further enhances our property’s list of retailers." Check out the trailer for the American Girl movie about doll/girl Kit Kittredge. She wants to be - what else? - a reporter. Kohl's and J.C. Penney joined the crush of stores breaking down the wall between Thanksgiving and commerce, with their announcements that they plan to open at 8 p.m. Thanksgiving Day. Granted, it was already a pretty leaky wall, with Toys 'R' Us, Target, Walmart, Sears and Kmart all opening on Thanksgiving Day last year. But with the announcements from Macy's last week and Kohl's Monday that they'll also open on Thanksgiving, the last bastions of retail resistance are crumbling. J.C. Penney will also open at 8 p.m. on Thanksgiving Day. The suffering retailer had held out for a 6 a.m. Friday opening in years past, meaning it was one of the last stores in line for customers to shop. "Obviously, we were one of the last to open (last year)," Tony Bartlett, J.C. Penney's executive vice president of stores, said in USA Today. But this year: "We're all in." "As many customers are eager to get a jumpstart on their shopping, we are opening our stores at 8 p.m. on Thanksgiving Day as a convenience to our customers who want to make Kohl’s their first stop," said Michelle Gass, Kohl's chief customer officer, in a statement. "Shopping over the Thanksgiving holiday weekend has become a much-anticipated tradition enjoyed with friends and family," said Gass. 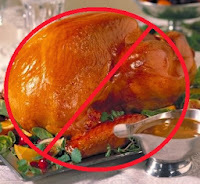 All of which means more people than ever before will likely be bolting from the Thanksgiving meal to wait in lines outside shops, or skipping dinner altogether. And more workers will miss their holiday, because they'll be prepping the sales floors for our arrival. But, as Gass hints, perhaps no retailer can afford to stay closed on Thanksgiving anymore. If your customers are spending all their money at your competitors, they might not have any left for you if you wait until midnight or even (as stores did just three years ago) 4 a.m. Friday to open. The early shopping rush still begs the question: Why go out and freeze your tail off on Thanksgiving day when you can shop online with your feet propped up in front of the fire, or football game? That's where I'll be with Amazon.com and my iPad. What do you think? 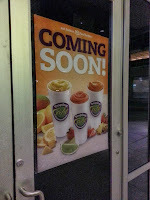 A new Tropical Smoothie Café is opening this fall at the Metropolitan complex, near uptown Charlotte. The restaurant will be near the Trader Joe's at the Metropolitan, next to the dry cleaning shop at the parking deck entrance. 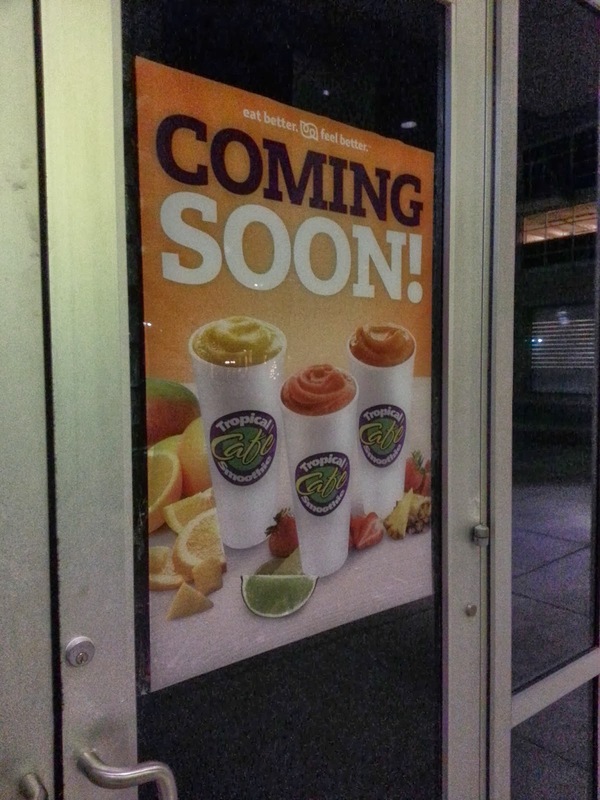 "Tropical Smoothie Café menu boasts bold, flavorful food and smoothies with a healthy appeal. Our food and smoothies are made to order with fresh ingredients. Our smoothies are made from superior simple ingredients including real fruit and natural sugar. Our toasted wraps, bistro sandwiches, grilled flatbreads, and gourmet salads are made fresh with high quality meats and cheeses; and topped with fresh produce and flavorful sauces. Combine that with a fun atmosphere and friendly hospitality and you see why people return again and again for the Tropical Smoothie Café Experience." The café doesn't list an exact opening date, but signs are up and work is progressing at the store. The Map Shop on East Morehead Street can seem like a charming anachronism, an ink-and-paper merchant in an ever more Google-ized world where everyone carries a map of the world in their phone. But owners Ted and Patrice Northrup say they're rebranding and refreshing the store, focusing on new areas such as travel books and mapping services for businesses, to stay in business - and grow. "People say, 'Map shop? How are you guys still in business?'" said Ted Northrup. The store has been in Charlotte for 22 years, 13 at its current location, even as Northrup estimates about 90 percent of map stores around the country have gone under. "If you're not changing, you're not staying." Some of the rebranding at The Map Shop will be subtle. Northrup said The Map Shop plans to drop the "The" from its name, a la TheFacebook.com becoming "Facebook." Other changes are more obvious. The store took off its awnings and some signs as it prepares to redo and replace them, and add a new logo. That's prompted some questions, Northrup said. "We looked at the building and said, 'You know, this is starting to look pretty tired too,'" he said. "Some folks have asked us if we're going out of business." Not even close, said Northrup. "The Map Shop still has a strong retail presence thanks to loyal Charlotte customers who appreciate unique specialty retail shops," he said. Now, they're doing more map finishing and framing. They're doing more maps for businesses to help illustrate sales territories, such as this one. They carry unique and custom maps, such as topographical relief maps for people with mountain houses. Annual sales are currently at just under $1 million, Northrup said. With more exposure, he thinks Map Shop can double that. "In the back of customers' minds they think they can find anything they want on the web," said Northrup. "We're competing with Google Maps. The key is for us to offer something they don't offer." It also helps that the business has been online since 1998, Northrup said, giving it time to establish a digital customer base. And in the world of physical maps, Northrup said he has to convince customers a map is worth spending on. Many buy world maps to pin their travels on, Northrup said. "I've been trying to educate customers about the value of a quality map," said Northrup. "You can buy cheesy Chinese maps with Chinese frames pretty cheap." After a quarter of a century uptown, the Rainbow Café has packed it in, as the owners move to focus on their catering business. The restaurant has already been emptied out (hat tip to my colleague Steve Harrison for the heads-up and a picture). "Thank you for 25 years of success! It's been a good run," the owners wrote in a note on the door. "We will be moving to expand and devote all of our time and resources to the Uptown Catering Company." 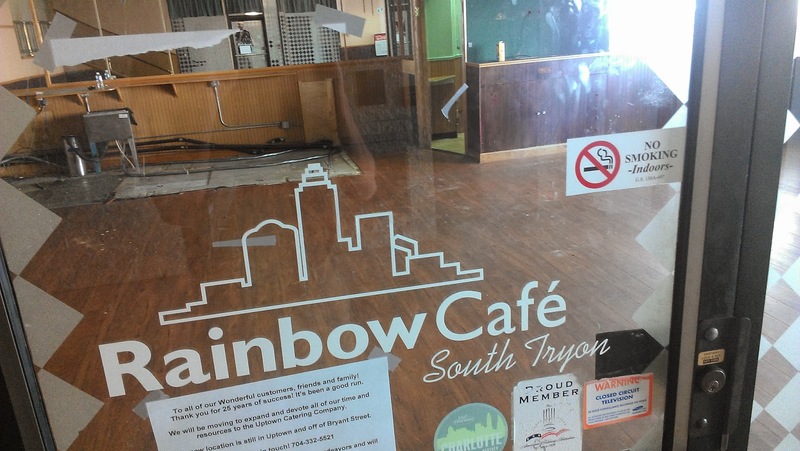 No word yet on what might replace Rainbow Café, which looks to be in a prime location across from the new Romare Bearden Park. Belk, Inc. is opening new and renovated stores in three communities around Charlotte on Wednesday, the latest in its program of updating stores. The Belk store at the Galleria Mall in Rock Hill has gotten a face lift, and now totals 100,000 square feet. The company is also opening two new Belk stores, one in the Morganton Heights shopping center in Morganton and one at the Wallace Commons shopping center in Salisbury. The company said the renovated Rock Hill store will carry a wider assortment of apparel, shoes, home goods and accessories. The Salisbury store is 75,000 square feet, and Belk said it cost $7 million. It replaces the former store at the Salisbury Mall, which had been open since 1986. The Morganton store is 66,000 square feet, and cost Belk $6.5 million. Belk said it is 16,000 square feet bigger than the Belk store it replaces at Fiddler's Run, which had been open since 1999. The Rock Hill store has been expanded by 20,000 square feet, Belk said. That means some departments, such as shoes, have doubled in size. The project cost Belk $5.5 million. Belk managers at all three stores issued identical statements Wednesday. “This is a great day for Belk and Morganton/Salisbury/Rock Hill," they said. "It represents the latest and best that Belk has to offer and was designed, built and merchandised especially for the Morganton market. We invite everyone to come visit our store and see the wide selections of top fashion brands and styles that we offer in a shopping environment created for the ultimate in customer service, convenience and enjoyment. We’re committed to offering the best in Modern.Southern.Style. and continuing our reputation as the department store of choice in Morganton." In Charlotte and Pineville, Belk has already renovated its flagship SouthPark store and the store in Carolina Place mall. The SouthPark mall was one of the company's most extensive, costing $2.3 million. The Charlotte-based company is the largest privately-held department store chain the U.S., operating 301 stores in 16 states. Another brewery is setting up shop in NoDa, near Birdsong Brewing, NoDa Brewing Co. and Heist Brewery: Free Range Brewing has a lease for a new building. The company is taking a 5,400-square-foot space at 2320 North Davidson Street, Daniel Hartis of Charlotte Beer reports. Free Range is the brainchild of brothers Jeff and Jason Alexander. They've been brewing up batches at home already, and won N.C. Brewer of the Year at the N.C. Brewers and Music Festival earlier this year. "No licenses or labels have gone through since the government shutdown, and a backlog could mean several months before Free Range Brewing’s license is approved. In the meantime, however, Jason and Jeff will set to work building out the space they have envisioned for some time. In addition to the brewery, Free Range will have a small kitchen that they will use to prepare lots of seasonal, farm-to-fork dishes. The kitchen will come later, but Free Range should be able to open with a prep space and the ability to serve cheese, charcuterie and freshly-baked bread." In addition to above-mentioned NoDa breweries, Free Range will be joining a Charlotte brewery lineup that includes Olde Mecklenburg, Triple C and the new Unknown Brewing Co.
Trish Bennett ditched her former job working in claims for State Farm insurance to open a celebrity-inspired women's clothing boutique on Selwyn Ave.
"This is my first store," said Trish Bennett, owner of doll. (a boutique). "I love it. I'm so glad that I did this. If I didn't do this, I would always wonder." Doll is one of several new, locally-owned stores at the renovated Colony Shopping Center, including The Sporting Gent, Woo Cosmetics and Skincare and Denim House. Bennett opened her doors on Sept. 26, and she's planning a grand opening on Oct. 24. She moved from Maryland (my home state, FYI) to Charlotte in April along with her husband. She said her ideas for what to carry in the boutique are influenced by the kind of laid-back celebrity outfits seen in magazine pictures of people such as Kim Kardashian out and about in their daily lives. "That kind of accessible fashion is what I wanted to bring to Charlotte," said Bennett. She carries "celebrity brands" such as Artelier by Nicole Miller, Cult of Individuality and Young, Fabulous & Broke. "I have denim that retails for between $120 and $180," said Bennett, who also carries graphic tees for under $100. "It's a little bit more accessible than your red carpet fashion looks." Bennett said she would like to carry clothes for men in the future. But for now, she has plans to install a TV in the back of the store for husbands and boyfriends shopping with their mates. And she has another perk for men along for the ride. "I do have beer to ease the pain," she said. Music to our ears, Trish. Big Gulp and Slurpee lovers uptown will soon have another reason to rejoice: According to Restaurant Traffic, a 7-Eleven is headed to the Catalyst development. As previously reported here, Hawthorne Retail Partners said recently that it has completed new leases at Catalyst, at West Martin Luther King Blvd. and South Church Street. At the time, Hawthorne said it was negotiating with "one of the world’s largest convenience store operators" about leasing a 3,700-square-foot store. Although I speculated it might be 7-Eleven (which is one of the world's largest convenience store operators). Right now, 7-Eleven has five stores within five miles of uptown, but none within the I-277 loop, according to the company's store locator. "Our sources tell us that 7-11 will start selling Big Gulps and lottery tickets in the early part of next year. 7-11 has an urban prototype that they will surely use. The Catalyst is directly across from Romare Bearden Park and the new BB&T Ballpark for the Charlotte Knights. Alcohol is forbidden in the park but with a convenience store close I am sure some people will bend or break the rules." For me, the best part about 7-Eleven (which I frequented in college, as it was one of the only places open past closing time) was always the Big Bite hot dogs. Nothing can quite replicate that perfectly salty end-of-the-night snack. I haven't had a Big Bite in years, but if this 7-Eleven opens just blocks from the Observer, I might well find myself back there. A new medical spa in Charlotte, Jon'Ric, has a grand opening and open house scheduled for Saturday from 10 a.m. to 4 p.m. on Woodlawn Road. The spa is a franchised facility owned and operated by Dr. Matthew Jones. Unlike a traditional spa, the facility also offers some medical appearances such as injections to improve one's appearance. "The menu of services offered include a full compliment of massage options, skin care and waxing, and mani/pedi services," wrote a spokeswoman. "Some of the many services that Dr. Jones personally offers include injectable treatments for facial wrinkles as well as laser treatments for uneven skin tone, vessels, hair removal, fine lines and wrinkles." "A Medical spa is the pairing of a cosmetic surgery office and a traditional day spa. This means that all of your aesthetic needs can be met in one location. Today’s Medical Spa offers a wide variety of services and treatments which provide a lucrative and needed extension to the physicians practice. A Medical Spa offers treatments that require a Doctor's supervision, such as laser resurfacing and Botox injections. It also offers spa treatments. A Medical Spa is a hybrid between a medical clinic and a Day Spa that operates under the supervision of medical Doctor." "Grand opening video of JonRic Armenia medical spa. An exciting first day of drinking , partying and botox flowing from champagne glasses. Speaking russian eating caviar and enjoying fountains of chocolate fondue." Denim House, a new store selling designer jeans and other apparel, plans to open in early December on Selwyn Avenue. The store will be at 2900 Selwyn Avenue. Owned by Tia Klein, the store will carry clothing and accessories for men and women. Designer lines will include Tellason Denim, Levi’s Made & Crafted, Adrienne Landau and McGuire Denim, as well as others. Klein, the mother of a five-year-old daughter, said she wants her store to be a place where people feel at home, with a "vintage-inspired vibe." Sleep Number, the mattress retailer, is opening a Charlotte store near Northlake Mall later this month. The 2,500-square-foot store opens on Oct. 25 at 9402 Northlake West Drive, across from Target. The store is Sleep Number's third Charlotte location, and employs four people. "When shoppers visit the new Charlotte Sleep Number store, they encounter a multi-sensory experience that goes far beyond the one-size-fits-all approach of other mattress retailers. Customers are guided by their Sleep Professional through interactive experiences that showcase the technological innovation of Sleep Number’s benefit-driven products. The result is a complete and individualized sleep experience that helps customers fully understand their sleep needs and allows customers to achieve their very best sleep." So sleep easy, Charlotte - the Sleep Professionals are on the case. Two new stores have joined the retail lineup at Colony Shops on Selwyn: a men's sporting clothing store and a skincare and cosmetics store. "From going afield or attending a society affair, the true sporting gent remembers the men of years past and the customs passed down from generation to generation. And he chooses to carry on those traditions in the goods he chooses to sport into the field, wade the river with, or wear to the dinner table. Quality, craftsmanship and years of loyalty are the defining influencers. We aim to outfit the true sporting gent in every man. Through a selection of products which highlight the key aspects of two very distinctive cultures, we will continue the tradition." Woo Skincare and Cosmetics ﻿is also now open at the shopping center. The makeup and skincare store has a grand opening planned for Oct. 23 that will benefit Freedom School Partners. The company is partnering with a local business to provide spa services. Woo is also hoping to take advantage of Charlotte's growing film and television scene. Here's Woo's description from their website: "Your local go-to place for your favorite makeup and skincare lines, with the best personal service." I've been away for a few weeks (getting married, in case you were curious), so here's a quick roundup of some of the news items about new stores that piled up in the email inbox. Hawthorne Retail Partners said Mellow Mushroom plans to open a new, 7,000-square-foot restaurant uptown in the Catalyst development, at West Martin Luther King and South Church Street, near the new Romare Bearden Park. The restaurant will open in late 2013.
operators" to lease out a 3,700-square-foot space in Catalyst. Uptown 7-11? The store is expected to open by spring 2014.
concept that offers the latest CrossFit and fitness products," said Hawthorne. The store and gym are expected to open later this year. Reebok sponsors CrossFit's official games and manufactures its apparel. In Myers Park, the Ultra Running Company has signed a lease for the 3,000-square-foot former Paul Simon space on Providence Road. The store, owned by ultra-marathon runner Nathan Leehman, will open later this fall. Merrifield Patrick Vermillion represented Leehman. Freshii opened its first Charlotte location Monday, in Overstreet Mall uptown. The store is in the BB&T building. Here's a short description from their website: "Freshii offers a menu of salads, burritos, wraps, rice bowls, yogurts, breakfast and soups made with high-quality, fresh ingredients." That's all for now. Check back later this week for more retail news.